As suppliers of complete filling and packaging lines there are various items of equipment that Enterprise Tondelli can supply that fall into this category. Of course even if what you are looking for is not found here that doesn’t mean we do not supply them! Stretch wrapping equipment; we can supply from semi automatic robot type wrappers to high speed ring wrappers with speeds up to 140 pallets per hour. Bottle driers; although this item appears in this section in fact they are of key importance. Applications include under crown drying to prevent mould growing under the crown edge, mass drying of containers at the exit of tunnel warmer etc and also body drying when using self adhesive or PSL transparent labels. Speeds range from 3,000 bottles per hour up to 60,000 bottles per hour and we can guarantee 99.9% dryness of containers. Body sleevers and tamper evident sleevers, Promotional paper neck tie applicators; these can be supplied in different outputs from 3,000 bph to 30,000 bph. Capsulars; we supply a whole range of capsulars ranging from single heads unites for heat shrink PVC or tin capsules up to machines for 36,000 bottles per hour. Combination machines are possible where both options can be fitted on a common carousel. 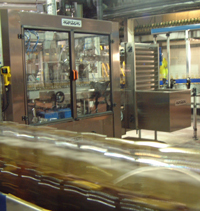 Over the years we have supplied units to many important wine bottlers with repeat orders. Wirers; for the wine industry we have supplied supply wirers for sparkling products where the fitting of a wire hood is essential. Waxers; with fine wines you often find that instead of a capsule the winery will dip the top part of the bottle in wax to give the aged appeal. We have a rotary machine which enables this to be done in an automatic and consistent way to give a very high quality dressed bottle. 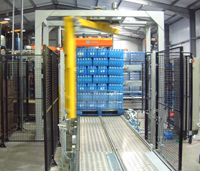 Lowerators, elevators; pad type units to allow bottles cans and cartons to change elevation without the usual need for long conveyors. Diameter change over is by hand wheels. Bottle inverters; these are typically used for inversion of bottles when they have been hot filled or with a sterilant in the product. We have two types of machines; a pad type unit where the bottles are turned upside down and also a plate type unit where the bottles are leaned so the liquid touches the underside of the can. Still not found what you are looking for then call us and we are sure to help.